1: SECURITY and 2 personnel. 2: An personnel and 2 SCIENCE. 3: SCIENCE and 2 Empathy. 4: Empathy and 2 Physics. 5: Physics and 2 Navigation. 6: Navigation and 2 SECURITY. 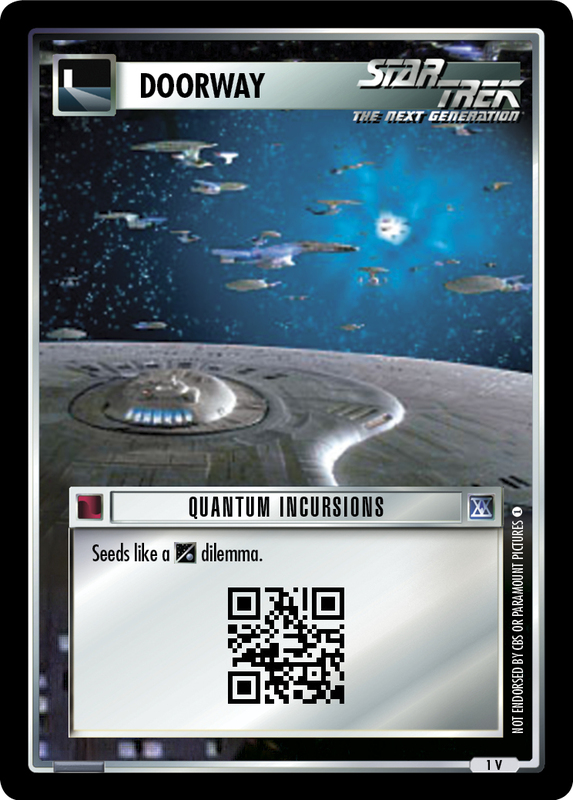 If you play OTF this card replaces the backward compatible 2E card Quantum Incursions from Fractured Time - ST1E compatible (the 2E card is no longer valide in OTF). Card logging info: First edited by Telak at Nov 20th, 2014. Please support openCards and validate game text of this card! Additional openCards collector info: 20th Anniversary Collection - Inspired by The Fajo Collection.